Not many people stick around a burning city after an evacuation order has been given. And still fewer return to a neighborhood that's actually on fire. But Marty Frost had some experience fighting fires in the past. 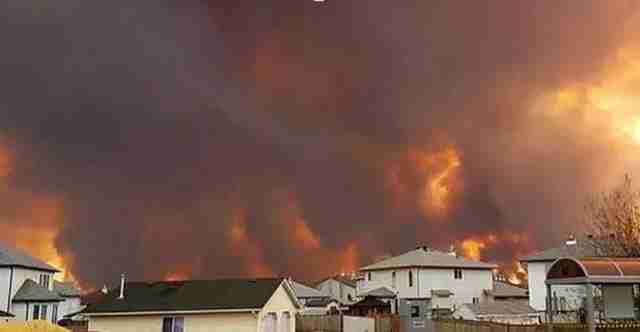 And Fort McMurray, the Canadian city besieged by a massive wildfire, needed the help. So too, it turns out, did the animals. Frost is credited with saving dozens of pets who were stranded after their owners were forced to evacuate the city. Among the hundreds left behind was a puppy named Max. Stephanie Greene and her family weren't allowed to return to their home in the Abasand neighborhood of Fort McMurray. That left Max locked inside their townhouse, amid encroaching flames. And a devastated daughter aching for her beloved puppy. Frost heard her plea for help the same way most heroes do these days. "I saw it on Facebook," he tells The Dodo. 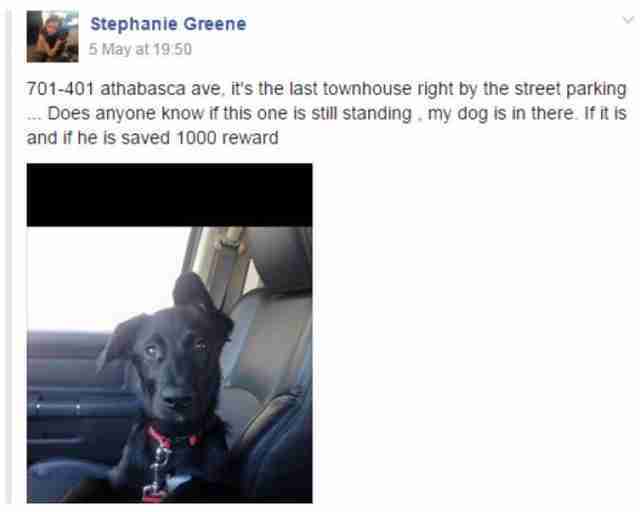 Greene had made an impassioned plea for someone - anyone - to rescue Max. But when Frost got to the Abasand neighborhood, it was almost unrecognizable. Even the street signs had melted. "I had gone up there several times to get him but couldn't locate the property," he says. Nevertheless, Frost kept returning to Abasand. On his last foray, a block of townhouses were starting to catch fire. He found the right house - at the moment rescuers were breaking down the door. Two of those rescuers, a volunteers Ricky Vassberg and Collin Renouf heard the sound of Max barking from inside the house. They had to smash through the bedroom door because Max's kennel wouldn't fit through it. "The whole experience was surreal almost apocalyptic I'm not sure it has quite sunk in," Vassberg tells The Dodo. Frost ended up making the call to Greene, as she recounted to CBC News. "It's actually probably bittersweet for you, because your house was just starting to catch fire when we rescued him," Frost told her. "I don't care about the house," Greene said. "We got exactly what we wanted." Max is among the lucky ones. He found his hero and not long after that, he was transported to Calgary to rejoin his family. Countless more pets are still waiting. You can also support the efforts of Ricky Vassberg and his volunteer crew who are returning to Fort McMurray to help rebuild homes for people who have no insurance.